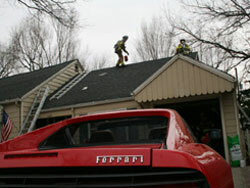 Fire crews pushed this Ferrari to safety on Sunday while fighting a blaze at a house in Olathe. Super Bowl Sunday 2009 should hold special meaning for one Olathe family. It will be the day firefighters saved the red Ferrari… Hall said the owner urged firefighters to save his prized vehicle in the garage — that red Ferrari…“It’s a pretty car,” Hall said.